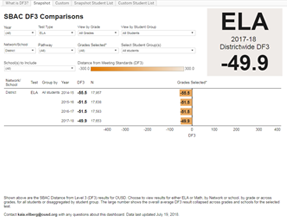 Use these dashboards to view SBAC scores for OUSD. Performance of students in each performance band and their claim scores. Scores for current students in Grades 4 and above. DF3 is a measure of how far away a student's score is from the score needed to meet standards for grade level. ​For comments or questions about this data, please email data@ousd.org.